This error occurs when you try to test one of the web service methods by using SoapUI. 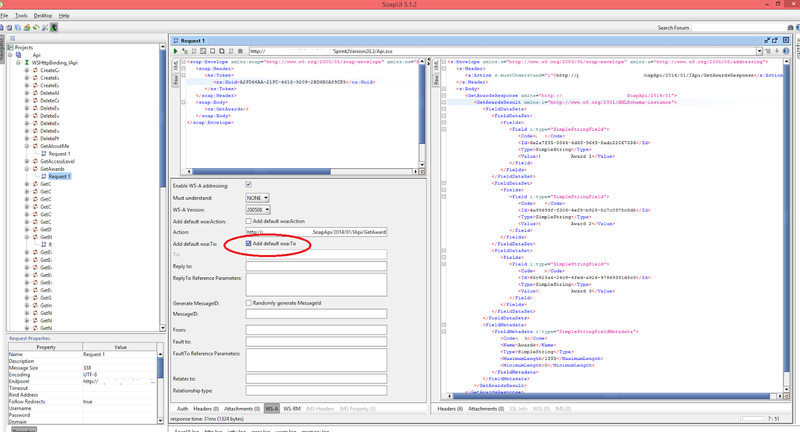 Check "Add default wsa:To" from WS-A tab as shown below. Solution for Umbraco Mvc Project Error: "Could not load file or assembly 'ClientDependency.Core, Version=1.7.1.2, Culture=neutral, PublicKeyToken=null.' or one of its dependencies"
This error occurs when trying to add a new controller to a Umbraco Mvc project(Umbraco version is 7.1.x.). This is an Umbraco bug and this is because of umbraco assemblies were built with specific versions. Upgrade the umbraco mvc version to 7.2.2 or later by using Nuget Package Manager.If you don't want to upgrade your umbraco mvc version, then you can just copy an existing controller and paste it and change it according to your project needs. This is the other way. That's all! Solution for "This configuration section cannot be used at this path. This happens when the section is locked at a parent level..."
This error occurs when there is a problem reading the configuration file for the Web server or Web application. Click "Start" button.Search for "Turn windows features on or off".In the Windows Features window, go to "Internet Information Services\World Wide Web Services\Application Development Features".Check all the features apart from CGI.Restart your IIS.